The Barcelona Card provides free admission to over 25 museums and sights, discounts to over 90 sights as well as the free usage of public transportation in Barcelona. Save money and time and enjoy your stay in Barcelona with your Barcelona Card! Shipping by e-mail voucher or by mail. Why? The Barcelona Card saves time and money during your stay in Barcelona and makes the trip easier. How? 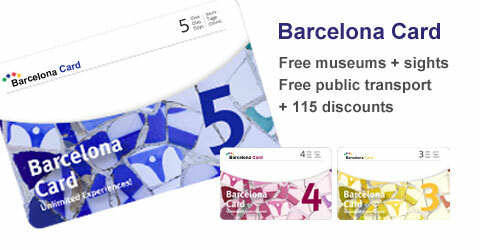 With the Barcelona Card you get free usage of the public transport, free admission to museums without standing in line as well as many other benefits. When? Book your Barcelona Card now. It's valid for 72, 96 or 120 hours and will be activated at first usage. Buy the Barcelona Card now and enjoy your stay! The Barcelona Card, perfect for your 3, 4 or 5 day trip to Barcelona, offers many advantages. You can find all included benefits in the overview of included services. The Barcelona Card is available for 72, 96 or 120 hours. For a two days trip the Barcelona Card Express qualifies. The Barcelona Card is available for 72, 96 or 120 hours, and not for 24- hour periods. It expires every day at midnight. This is why we recommend you start using the Barcelona Card as early in the day as possible, so you can make the most of the offers and enjoy the great savings featured. The card is for individual use and is not transferable. Full flexibility: You can decide the days of usage within the respective year of validity. You don't have to determine the dates when buying the Barcelona Cards. Beginning of validity is the first usage of the Card. The Barcelona Card is valid on consecutive calendar days. Simply add the desired number of Barcelona Cards and choose the method of shipping. You have a choice between shipping via post or vie E-mail (voucher). You can get an overview of the shipment methods, times and costs on our page shipping. You will receive the discounts right at the respective box offices. At sights where you don't have to stand in line, you can just walk through the entrance while showing your Barcelona Card. If you buy 10 or more Barcelona Cards you will receive our group discount. We sell Barcelona Cards for children (4-12 years) at a lower rate. Booking without risk: You can return unused Barcelona Cards you have received via mail until 15 January of the following year. We will refund the full buying price. Online booking: fast and safe. Choice of shipping via mail or via E-mail (voucher). Plans change: no determination of dates necssary. Our voucher is valid for the whole calendar year. Barcelona Cards, received via mail, will be valid with the first day of usage. No risk: Barcelona Cards, received via mail, can be returned to us until the 15th of January of the following year. We will refund the entire price.